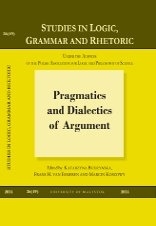 Pragmatics and dialectics are two disciplines which have been amongst the first and most important partners for argument studies in the exploration of the complex realm of communication. Treating argumentation as a construct consisting of premises and conclusion allows for investigating some interesting properties of the phenomenon of reasoning, but does not capture a variety of aspects related to the usage of natural language and dialogical context in which real-life argumentation is typically embedded. This special issue explores some of the fascinating research questions which emerge when we move beyond logic into the territory of the pragmatics and dialectics of argument (the issue's cfp). The journal SLGR is published under the auspices of the Polish Society for Logic and Philosophy of Science, and is one of Poland’s top philosophy journals with an international profile and indexed on lists such as Scopus, ERIH and IndexCopernicus. The unique profile of Studies in Logic, Grammar and Rhetoric lies in exploiting the three classical fields of the medieval trivium in the studies of communication. The journal was founded in 1980 by Witold Marciszewski – the logician and philosopher whose research is deeply rooted in the tradition of the Lvov-Warsaw School. Since 1980, SLGR has published 51 volumes. The SLGR journal is published under the Open Access policy, so all the papers can be downloaded for free.